Pictured above you can see an iron wine cellar door that we recently installed in Sonoma, CA. Our customer fell in love with this iron door and thought it would be the perfect finishing touch to their newly renovated wine cellar. 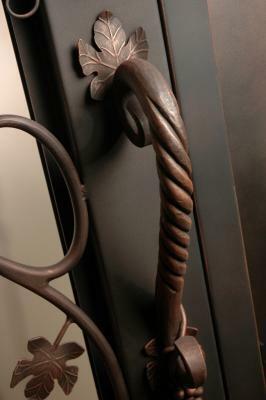 Our iron wine doors are not only elegant and unique but they are made to last. With dual weather stripping and full insulation our customer does not have to worry about warmth seeping in, but with hand forged scroll work placed in front of an insulated and operable glass panel you have the ability to showcase your wine collection and living in Sonoma means a plethora of note worthy wines to chose from. Our team here at Signature Iron Doors invites you to take visit our website and contacts us to see how we can create a custom Iron wine door that will match your impressive collection.